“Jataka Tales of the Buddha,” by Ken and Visakha Kawasaki. 1,298 pp. Buddhist Publication Society. Available at Asia Books, Orchid Press and Kinokuniya. 900 baht. The growing popularity of Buddhism in the West has made the life story of the founder of this great faith familiar to many far beyond its Asian homeland. But how many in the non-Buddhist world realize that the story of Siddhartha Gautama, the Indian prince who grew disenchanted with his life of privilege and eventually attained Enlightenment, was just the tip of the Buddha’s biographical iceberg? We all know that reincarnation is a key feature of Buddhism, but there are probably very few outside of Asia who have more than a passing acquaintance with the vast body of lore related to the Buddha’s previous existences. And yet these stories, known as Jataka tales, have for centuries guided untold millions along the Buddhist path to Nirvana. Even this very substantial collection, which runs to a total of nearly 1,300 pages, barely scratches the surface of all that has been said or written about the Boddhisatta—the Buddha in his previous incarnations—although it does a very good job of conveying something of the richness of this literary tradition. According to the Kawasakis, there are a total of 547 Jataka stories, representing just a fraction of the 2,500 or so Jataka verses in the Tipitaka, the authoritative Pali-language collection of Buddhist scriptures. While the verses are considered canonical, however, the tales based on them are classified as commentaries, and thus elaborate considerably on what the Buddha is said to have told his disciples about his past lives. For religious purists, this may detract from the value of the Jatakas as they are presented here; but lovers of a good story can only be grateful to the monks who first wove these tales into their sermons to lay audiences, and to the Kawasakis for presenting them in clear, readable and entertaining prose that captures some sense of the earthy and yet sublimely moral universe they describe. 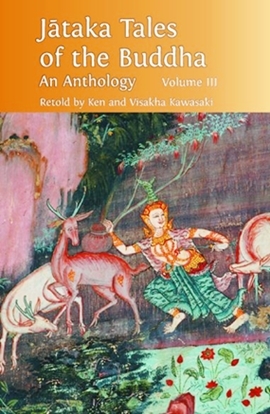 Many of the stories are simple fables, like that of the monkey king who outsmarts a ravenous yakkha in the tale of the “Hollow Canes” (“Nalapana Jataka”: for the benefit of the Pali-challenged, all of the stories in this anthology are given English as well as their original Pali titles), while others deal with the world of merchants, farmers and officials. Still others recount the lives of royalty and devas, beings who exist on a higher plane than humans, but who remain subject to the suffering of Samsara, the realm of conditioned existence. Whatever their particular setting or cast of characters, all of the stories serve to illustrate how the cultivation of virtue gradually led to the Buddha’s eventual realization of a way out of this suffering, making them the ideal guide to lesser beings aspiring to follow his example. In many cases, the tales also detail how the Buddha liberated others along the way to his own ultimate liberation, often from the grip of defilements so profound that they seem beyond redemption. One such story is that of “The Man-Eater of Jambudipa” (“Maha-Sutosoma Jataka”), which tells of a king who is banished because of his insatiable appetite for human flesh. A close reading of this tale would probably hold valuable lessons for modern addiction counselors. Most of the stories are not quite so horrific, although many go to extremes to make their point. In “The Rabbit in the Moon” (“Sasa Jataka”), for instance, the Boddhisatta appears as a rabbit who demonstrates his capacity for generosity by offering himself as food to a mendicant. Another tale, “The Most Difficult Feat of All” (“Dasana Jataka”), offers a more subtle understanding of what it means to give of oneself completely. In this story, a king takes pity on a young member of his court who has become infatuated with his chief queen and decides to “lend” her to him for a week. When the queen and the courtier run off together, it is the king who becomes afflicted by mental torment. He is cured, however, when he is made to realize that the highest form of generosity, and therefore the most meritorious, is that given without regret. This theme is taken to even greater lengths in the final and longest story of this collection, “Prince Vessantara” (“Vessantara Jataka”). Although he is the antithesis of the man-eating king of Jambudipa, Prince Vessantara shares his fate and is exiled by his subjects for what they see as his excessive acts of generosity. But this doesn’t stop him from giving, and in the course of the story he hands over not only his wife but also his children. Eventually, however, with the help of Sakka, the king of the devas, the family is reunited and the prince returns to his people to become their king. Each of the stories in this anthology is accompanied by an elegantly simple line drawing that perfectly matches the Kawasakis’ writing style, which is a vast improvement on earlier attempts to render these tales in English. In their hands, the Jatakas regain their ageless appeal, ensuring for them a wide and appreciative audience for generations to come.